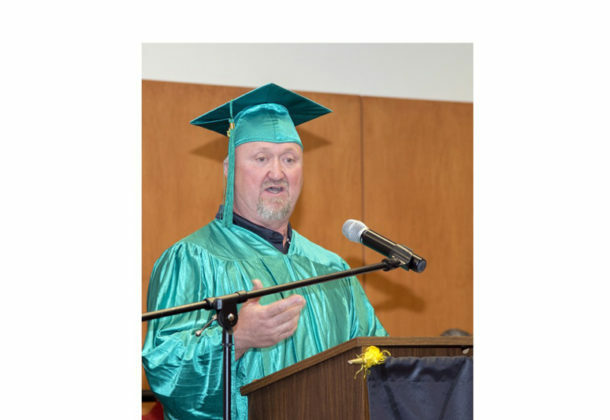 Mark Cooksey of Waldorf is 51, and has finally earned his high school diploma through the Adult Education Program at the College of Southern Maryland. He says the program allowed him to right some of the wrong turns in his life, rewrite his future, and accomplish it all – in only two months. For the next 36 years, Cooksey said, he struggled, “working harder and longer than everyone else” moving through the ranks, and landing a job in the energy industry. Mr. Cooksey said he kept his secret of never graduating, until he was offered a promotion at work. That was the moment Cooksey decided to do something, and to do it with fierce determination. “The first day I met him – he asked what was the fastest anyone has done this,” said CSM’s National External Diploma Program Lead Advisor Trudy Rice, who has administered the program for 19 years. Students in the NEDP program review 10 content areas, which Ms. Rice describes as “a lot of work, but very rewarding.” It offers workforce development-focused courses that help adult students with practical, real life areas of study. Unlike the General Educational Development, which is a timed test, NEDP provides a supervised study guide with material and student review provided by Ms. Rice and other advisers scattered across the state at other community colleges. “He came in every week and completed his work with flying colors,” she said. “There he was, learning a new job, learning new software at work, being a husband, a father, and studying to get his high school diploma. He was driven. It was incredible to see how hard he worked to get through the program. I started working during the weekends just to keep up with him. Mr. Cooksey said that once he made the decision to get his diploma, and with the guidance and support from Ms. Rice, the NEDP program was manageable. Calling his journey “one of the best times” of his life, Mr. Cooksey said there is nothing to hold him back now. There are more than 500,000 people in Maryland without a high school diploma, according to Ms. Rice, yet very few people know about the National External Diploma Program which is available at community colleges all over the state. This web-based program for adults and out-of-school youth offers flexibility to earn a diploma. The online program allows students to work at their own pace with guidance and review from an adviser or assessor. “It fits in well with our working clients who have a hard time making it to the Adult Basic Education classes we offer at the college,” Ms. Rice said.